A mandoline would have made quick work of this. Somehow, slicing even one bulb of fresh fennel struck me as tedious. And color-wise, I thought the juicy sections of blood orange would show off more against the snowy-white fennel; taste-wise, I thought there'd be more sweet/sharp contract too. So once I invest in a mandoline, I'll make this again and use grapefruit, for an all white salad with some taste contrast! (Or maybe pink grapefruit!) It does have really good crunch and is perfect for this time of year when we seem to want to sweep heavy wintry foods from the table. FROM THE ARCHIVES In 2006, I collected fennel recipes from food bloggers, a great collection of fennel recipes, from appetizers to desserts. My own fennel recipes are in the Recipe Box. A YEAR AGO ... Napa Cabbage, Herb & Mango Salad with Asian Dressing "Even late on a chilly spring evening, this tasted so fresh and alive ..."
Combine all the ingredients. Serve immediately. 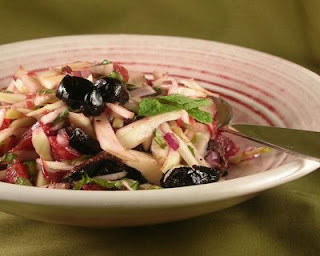 As I'm trying to learn to love raw fennel, this is a great recipe to add to my repertoire. I'll use my mandoline, which can shave the fennel paper thin (okay, I look for any excuse to use my beloved mandoline!!). Aren't blood oranges just the most beautiful fruit? Great idea to combine them with the licorice bite of fennel! Perfect! I have a pink grapefruit aching to be used, and a need for a simple fresh side for tomorrow's barbecue. No mint, but plenty of basil - I'll try that :) Yeay! Thanks! And so you did, Anne! Yours with pink grapefruit looks luscious! So glad it worked out for you!